Relying on our expertise in this domain, we are engaged in offering Computer Mini Loud Speaker to our respected clients. Speaker Drive Unit : 2.25"
We are the leading supplier of speakers. We are offering an array of best quality speakers which are sourced from some of the reputed vendors of the market. These computer speakers a surround realism in games, movies and general applications on the PC or notebook. 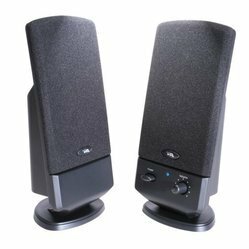 The speakers that we offer have good sound quality. All branded computer speakers are available at affordable price.